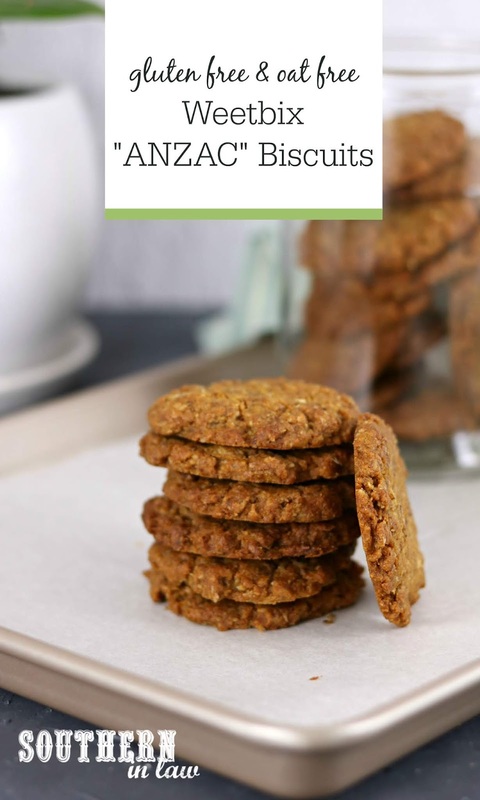 ANZAC Biscuits get a gluten free makeover with this Easy Weetbix ANZAC Biscuits Recipe. A clever twist on the traditional cookie, these biscuits taste like the original but are oat free, gluten free, egg free, nut free and so easy to make. Perfect for Australia Day celebrations or an anytime treat! Often times people who have to avoid gluten also have to miss out on all the delicious treats - but that doesn't have to be the case. 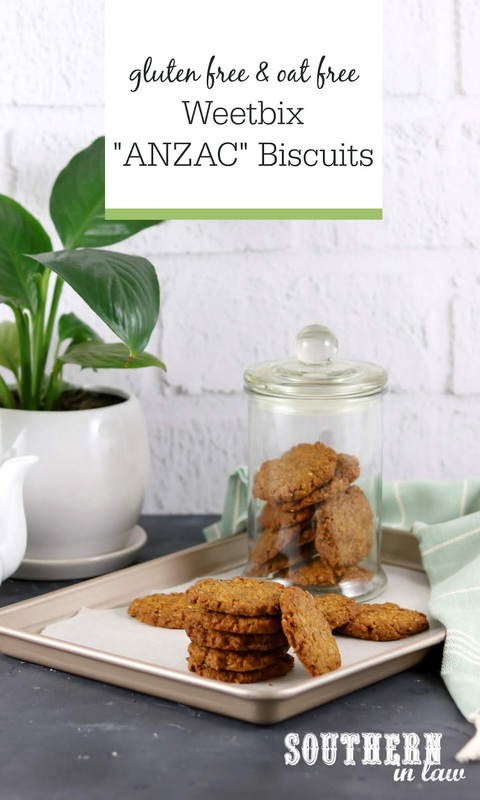 The first ANZAC Day after I'd be diagnosed with coeliac disease, I found myself attempting all the gluten free ANZAC biscuit recipes I could. My kitchen was a mess of coconut, quinoa flakes, rice flakes, weird flour mixes, and a whole lot of failed cookies. The quinoa flakes were horribly bitter, rice flakes were way too hard and making them just with flour just didn't work. Later on, I found out I could safely eat gluten free oats (read more about that here), however, as gluten free oats aren't a thing in Australia (as 1 in 5 coeliacs will have a reaction to uncontaminated oats similar to how they react to gluten), I know there are plenty of other coeliacs still struggling to find the perfect gluten free ANZAC biscuit recipe. So I got to experimenting. And last month, I had an a-ha! moment, which was really more like a "you idiot! Why didn't you think of this sooner?!" moment - and came up with the perfect recipe. This ANZAC Biscuit Recipe uses crushed gluten free Weetbix - making them the perfect way to use up the crumbly bits at the bottom of the Weetbix box - whilst also creating the most perfect gluten free ANZAC biscuit recipe. These ANZACs have become a family fave. So much so that Jesse now asks for them over a traditional oat version. They're crisp and chewy on the edges and soft and delicious in the middle - and they take just minutes to make. So go on, do yourself a favour. Make yourself a batch of these, brew a cup of tea (or coffee) and enjoy some fresh from the oven tomorrow as we remember the sacrifice of our ANZAC soldiers - and all of the men and women who devote their lives to protecting our country. Posted by Kristy Sayer-Jones @ Southern In Law 0 Comments - Join the Conversation! The perfect Easter Dessert Idea, this No Bake Cheesecake Filled Easter Egg Recipe is gluten free, grain free, egg free and SO easy to make. Simple and perfect for parties, kids and adults alike will love these fun treats. I do not like eggs... unless I can't taste them. Frittatas? I can sometimes do. But hard boiled eggs, scrambled eggs, fried eggs, boiled eggs? That's a big fat nope from me. But chocolate eggs? You know I'm all for them. 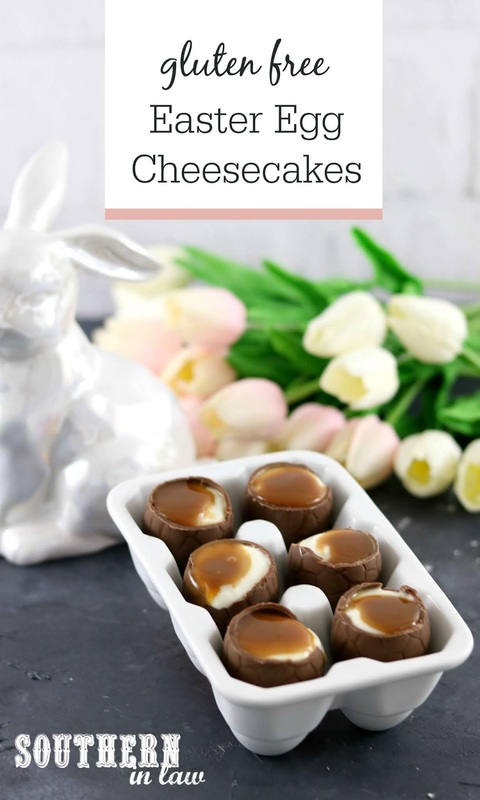 So, this Easter, I decided to put a new spin on hardboiled eggs.... swapping chicken eggs for Easter eggs and filling my hollow Easter egg shells with a delicious cheesecake filling. Topped with caramel sauce, they look kind of like a hardboiled egg - but taste SO MUCH BETTER. This is the perfect dessert to impress your friends and family this Easter. They look impressive (especially if you serve them in individual egg cups with little spoons) - but take literally minutes to make. 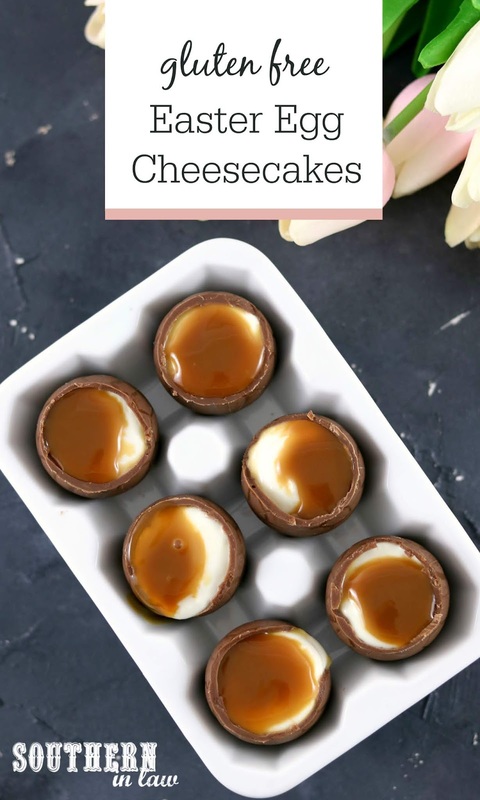 Each of the eggs are filled with a no-bake cheesecake mix and then topped with a dollop of caramel sauce just before serving. If you want to go the extra mile (or should that be egg-stra? ), add some cookie crumbles to the bottom of each egg for the full cheesecake experience. But enough chatting - you came for the recipe, right? !